Madhya Pradesh farmers' unrest: Out of work between harvesting and sowing seasons, they rode the highway and forced vendors and traders not to do business. For thousands of unemployed youths who live in villages off the nearly 60-km stretch between Mandsaur and Neemuch in Madhya Pradesh , a solitary soybean plant is the only major hope of employment other than agriculture produce markets or mandis. There are some opportunities in the two towns themselves, famous for licensed opium cultivators and a parallel illegal market, which have brought relative prosperity to this region bordering Rajasthan. In between, however, there are no plants or factories to offer jobs. Job-seekers from these villages have to travel to Ratlam, Pithampur, Neemuch or to Indore, 200 km away. 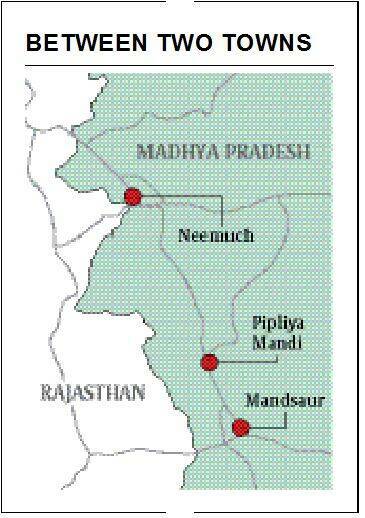 There are a couple of soybean processing plants in Neemuch and a cement factory in Nayagaon, 18 km away, but clearly not enough to absorb them all. After the winter crop is harvested and before sowing for kharif crop begins, youngsters of farming families have nothing on their hands. It was such a crowd that was on the streets from June 1, the first day of what was to be a 10-day strike called in support of fair price for crops. Even the opium growers had protested recently, as also last year, with an entirely different demand. Their protests went largely unnoticed outside because the number of licensed cultivators in Mandsaur, Neemuch and part of Ratlam — the three districts where legal cultivation takes place — is less than 20,000. Forcing vendors not to venture out, throwing onions and tomatoes and spilling milk on the streets, the youngsters roamed in towns and took to highways on their bikes from June 1 to June 4, their aggression increasing by the day. 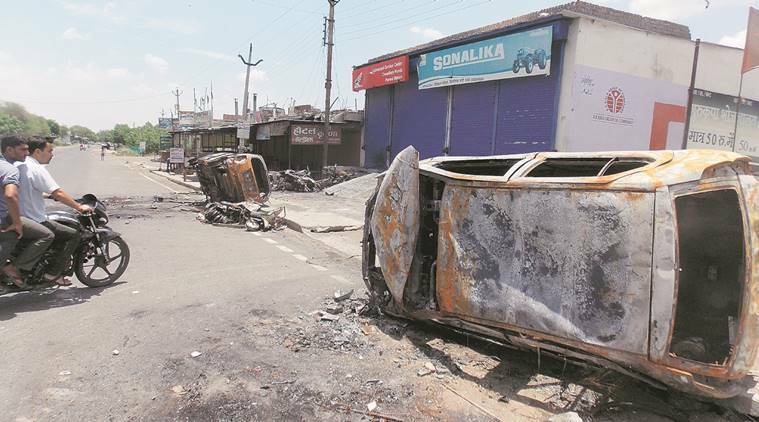 The seeds of the violence that eventually led to the killing of five protesters in firing were sown in Pipliya Mandi town, about 15 km from Mandsaur on the way to Neemuch, on the evening of June 4 when a near 1,000-strong mob forced traders to down shutters. “They indulged in hooliganism and loot, insulted shop-owners and their family members. Where will the owner whose shop and house are here go even if he wants to shut the shop down?” said a veteran trader, Manohar Lal Jain. Even after curfew was lifted from Pipliya Mandi, the traders were not ready to open their shops until they were provided protection. “We only requested them to show solidarity with us by downing shutters,” said Sukhlal Patidar of Barkheda Pant village, seated next to Dinesh Patidar, whose 19-year-old son Abhishek was the youngest victim of firing. One trader was so upset by the mob that he chased and beat up a couple of protesters on June 5; the video was widely circulated by farmers among themselves. At least three protesters were beaten and one of them had to be rushed to hospital in critical condition. “Do what you want. We won’t shut our shops because we have suffered losses. There were just four or five traders but they were adamant,” said Sureshchandra Patidar of Chillod Pipliya, at the house of Kanhaiyyalal Patidar, the eldest of the firing victims. The protesters returned and set fire to properties of four traders who had refused to down shutters. Both sides were angry with the local police; the traders felt the police were doing little to control the situation, and the farmers accused them of siding with the traders because of their financial clout. While who exactly fired and under what circumstances is now the subject of a judicial probe, it was amid this volatile situation that two firing incidents took place near Pipliya Mandi on June 6 leaving five protesters dead: a teenager, three under 30, and one aged 44. “We had been repeatedly attacked but we kept cool even when some of us were injured,” said a police official posted at Pipliya Mandi who cited the tussle between traders and protesters as the genesis of the violence. Describing the plight of the policemen, Home Minister Bhupendra Singh said, “They were at the receiving end for days.” He had initially claimed that the police had not fired but later said they probably had because Pipliya Mandi police station was under siege. Bumper production, falling prices, demonetisation and alleged involvement of criminal elements all contributed to the anger among farmers; the police firing came amid the standoff between traders and protesters. Since demonetisation, traders who buy produce at mandis gained an advantage that allowed them to manipulate prices and exploit the farmers’ need for payment in cash, a major factor behind the agitation. The Pipliya Mandi police station, which now resembles a fortress with security personnel milling around, has 65 villages under its jurisdiction. Nearly two dozen vehicles were set on fire by protesters on a 3-km stretch of the highway between Bahi Parshwanath and Pipliya-Mandi, the epicentre that remained out of bounds for authorities for hours on June 6 and 7. Hundreds of youngsters would come out, pelt stones at police or indulge in arson and then melt into nearby fields. Malhargarh Police Station is also on the highway but has only 32 villages under its jurisdiction. It saw far fewer incidents of violence than Pipliya Mandi. “There are no job opportunities here. My job as a tempo driver earns me Rs 300 to Rs 400 but I lost even that meagre earning for days. I sat home to save my tempo because if I had ventured out it would have been torched too,” said Babloo Pathan of Malhargarh. “If you are landless, working on daily wages is the only option,” he said, hoping for the situation to improve.